Dr. Nasia Safdar, medical director of infection control at UW Hospital, talks to reporters Wednesday about four patients who have developed Legionnaires' disease, a type of pneumonia that may have been caused by recent changes to the hospital's water system. Four UW Hospital patients have developed Legionnaires’ disease, an unusual cluster of the potentially fatal bacterial infection likely caused by a recent move to reduce water flow when demand is low, a hospital official said Wednesday. Three of the patients remain at the hospital, in fair condition, said Dr. Nasia Safdar, the hospital’s medical director of infection control. She said they have other medical problems that may have been made worse by Legionnaires’, a type of pneumonia caused by bacteria typically present at low concentrations in tap water. One patient has been discharged. The four patients, all being treated with antibiotics, range from 45 to 80 years old. Other cases are possible within the next two weeks, the bacterium’s incubation period, after the hospital planned to extensively chlorinate its water system to kill the bug late Wednesday, Safdar said. No patients at the hospital were allowed to take showers late Tuesday or on Wednesday because Legionnaires’ spreads in airborne droplets from hot water. It is not spread from person to person. American Family Children’s Hospital is not affected, officials said. The unusual cases of Legionnaires’, which can be especially harmful to patients sick enough to require hospitalization before exposure, were likely caused by an effort started about three weeks ago to save water by curbing flow at low-demand times, Safdar said. Bacteria can grow more, and potentially hazardous biofilms can form, when water is more stagnant, she said. The reduced flow program has stopped and won’t resume, she said. 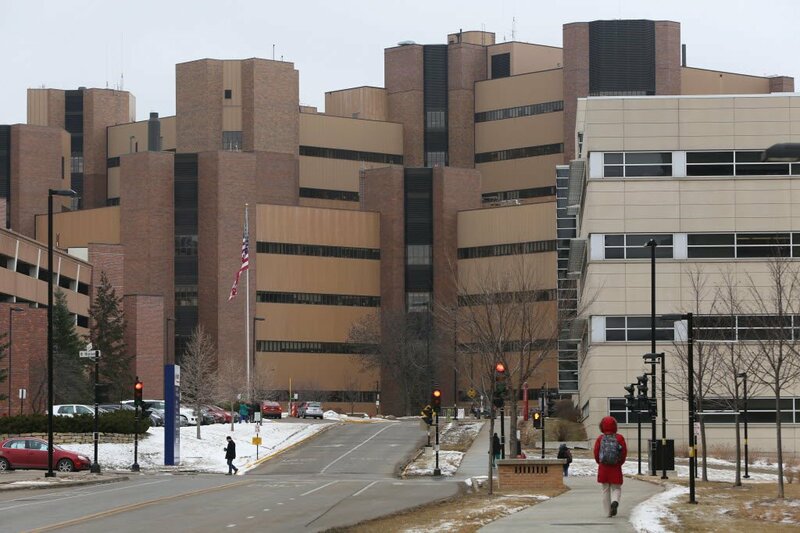 Two of the four patients had been recently hospitalized at UW Hospital and discharged before reporting to other facilities with symptoms of pneumonia. They were returned to UW Hospital, and another one has been there for several weeks. Urine tests on all four patients, conducted within the past 10 days, were positive for Legionnaires’. The hospital plans to collect bacteria samples from the patients to see if they share the same strain and the strain discovered in two of their shower stalls. Positive tests have been found only in parts of the hospital, but the problem is believed to be facility-wide. She said the Legionnaires’ bacterium is ubiquitous in large, complex facilities. “If you need medical care, you’re not going to find a health-care facility where Legionnaire’s hasn’t been recovered at some point,” she said. In 2010, a waterfall at a Milwaukee-area hospital was named as the source of an outbreak of Legionnaires’ disease, prompting St. Mary’s Hospital in Madison to shut down two decorative water walls for testing. At the time, UW Hospital kept its three water walls running and UnityPoint Health-Meriter closed one of its two waterfalls for mechanical repairs. Until this month, UW Hospital hadn’t had any cases of Legionnaires’ acquired at the hospital in 23 years, the hospital said in a statement. Safdar attributed that to a copper-silver ionization system that disinfects the water. Nationwide, about 6,100 cases of Legionnaires’ disease were reported in 2016, according to the Centers for Disease Control and Prevention. That figure is likely an underestimate, as many cases go undiagnosed. About one in 10 people who get sick from Legionnaires’ disease will die, the CDC says. Among people infected at hospitals, nursing homes and other health care facilities, roughly one in four will die, the agency said last year. Legionnaires’ is named for a 1976 outbreak at an American Legion convention in Philadelphia, which hospitalized more than 200 people and killed 34. Cold tap water poses no risk, officials said. Healthy patients who may inhale water droplets with the bacteria are at low risk. Those at higher risk are people older than 50 and those with lung disease or compromised immune systems. UW Hospital said it monitors its water routinely and whenever a patient is suspected to have Legionnaires’. The hospital notified the state Division of Public Health of the situation.